Spicebush is a many branched shrub or small tree. Blooms in the early spring with small greenish-yellow flowers, similar to a forsynthia. Male and female plants are separate, with only the female forming bright red berries, which are attractive to birds. Both a male and female plant is necessary for the female to form the berries. Native to much of the eastern US. It can grow to a height of 6 to 12 feet, but is usually smaller. Spicebushes are hardy, can tolerate a lot of shade and do well in most soil types, including clay. 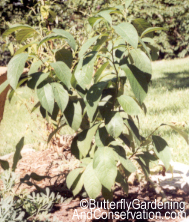 It is an excellent choice for an easy to grow, native plant that is beneficial to wildlife. Spicebush Swallowtails use both Spicebush and Sassafras as a host plant. Spicebush Swallowtail caterpillars are one of the most fascinating caterpillars I've ever seen. Click on the link above to see pictures of both the caterpillar and the adult butterfly. I highly recommend Nature Hills Nursery. The price for one Spicebush at the time I'm writing this is $17.95, but could change as the supply available changes. You can read more information about them at the Nature Hills Nursery site to either order, read more detailed information about about Spicebushsz or see more detailed pricing information. Or order by calling 1-888-864-7663 using the Source ID: 86642! You can also sign up to have a seed and plant catalog from Nature Hills Nursery mailed to your home to order from also. 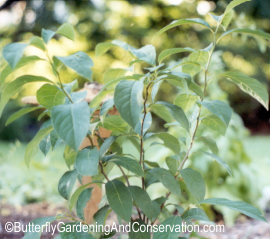 Native nurseries are about the only other places that sell Spicebush. It is not easy to grow from seed either, so it is best to buy a live plant. Spicebush is a member of the Laurel Family which consists of mostly large trees and a few shrubs. Avocados, bay leaves and cinnamon are produced from members of this family.